Stephen said about five times “how fresh” this tasted. He loves that clean feeling to a meal. It fed us (two servings for him) and even left enough for lunch leftovers for today. A little trick that I used that I should share: my scallops were frozen which meant when they thawed they had a lot of moisture. I drained them as well as I could and then tossed them in a bit of seasoned (salt and pepper) flour. Make sure your pan is VERY hot before you put the scallops in as they will steam instead of panfry and will taste like erasers. 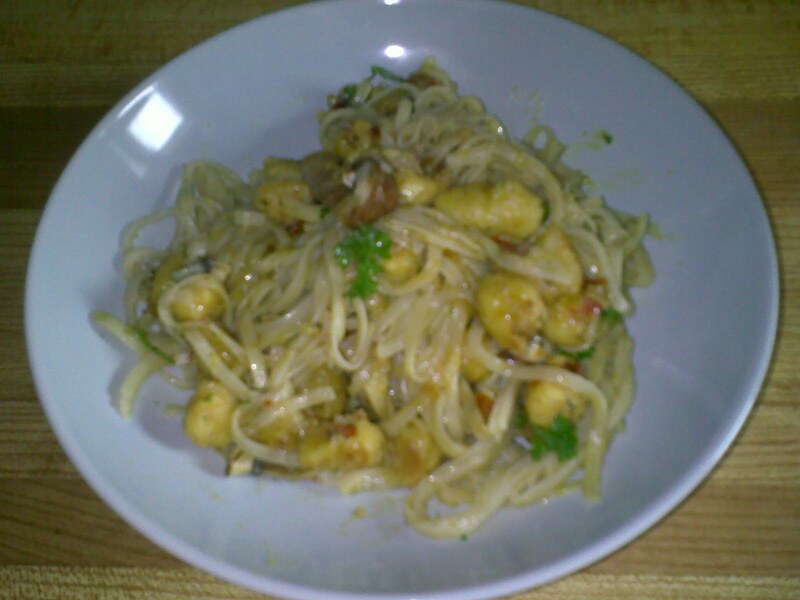 You could easily turn this into a company dish with nice big scallops from the fish market and some angel hair pasta. I topped the whole thing with a bit of fresh parsley from the garden. This can cook away while Madison and I are at swimming and uses up some of the ingredients I have in the house before we get our bin tonight. Add all ingredients to slowcooker except for sour cream. Cover and cook on low for 5 to 7 hours. Stir in sour cream. Heat through. Serve over egg noodles. I’ll pair this with an herb salad made from whatever is good in the garden (cilantro, arugula, tarragon, parsley, basil…) and a bit of balsamic vinegar.